Each and every one of our employees represent the spirit of our company: driven, committed, and acutely aware of how limitless Vdile Solutions’s potential is to grow. We go to great lengths to identify self-starters with diverse experience and skill sets to produce not just an effective workforce, but a well-rounded, talented and complementary team. Click through our Employee Spotlights to learn more about our team and what motivates them. Ogwudile Felix Chika MD /CEO (BSc.MCIPS, MCIPSN, DCert Mgmt Wales). Mr. Felix is a member of the Chartered Institute of purchasing and supply both in the United Kingdom and in Nigeria. He also holds a postgraduate diploma certificate in Business administration and Project Management from the University of Wales. A graduate of applied and industrial biochemistry from Nnamdi Azikiwe university Awka Anambra state started his career as an account officer with the Central Bank of Nigeria in 2003. He later moved to MTN Nigeria as an inventory accountant, He rose from this position to become the Warehouse controller in 2004 from where he moved to core procurement and supply chain management in 2005. He later became the procurement manager MTN Nigeria in charge of process administration category and service category comprising of merchandising, marketing, facilities management, event management, sponsorship, customer services, human resources and corporate services sub categories. Felix has over 8 years of management and procurement experience. He has passion for modern technology in personal and building securities and an ardent driver of value and cost savings. Chidile Emeka Festus is a graduate of electrical and electronics engineer from the institute of Management and Technology Enugu state. He started his career at the federal ministry of science and technology's Project development institute. He also worked with the Lagos Island Local Government ministry of works and housing before joining V-Dile solutions as a project coordinator. Festus has 2 years working experience and is responsible for project analysis, monitoring and reporting. A graduate of B.Tech in Physics/Electronics Technology has got more than 8 years experience in planning and implementation of CCTV, IP Based CCTV Systems and Remote Viewing over LAN and WAN (internet). He has also carried out a lot of projects in Fiber optic installation, termination, splicing and troubleshooting. 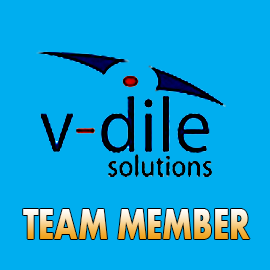 He will be bringing the wealth of knowledge as he operates as a technical consultant for V-Dile Solutions. Alex is a BSc. Holder from Nnamdi Azikiwe university, an aspiring member of the institute of Chartered Secretaries & Administration. He has worked extensively as a marketing and sales consultant. Alex has 5 years working experience in Sales and Business development prior to joining V-Dile Solutions where he will be in charge of creating regional channels for the business. An MBA holder in financial management, had his first degree in Electrical and Electronics Engineering from Nnamdi Azikiwe university Awka, and with over 15 years experience in business management; James will be in charge of creating sales for V-Dile Solutions products across the West African region. He is also a director at former industries Nigeria and a strategic partner to LG, Nokia and many other blue chip companies. James has a track record in developing market strategies, generating sales, developing new markets, closing deals and negotiations. He will ensure that the company products and services become a house hold name in Nigeria and the West African region. Mr Franklin is a high skilled technical team lead for V-Dile, haven been with the company and carried out seasoned training with our international partners, he is equipped with all the technical skills of enabling GPS technology.